It was a night of celebration as the Hollywood Foreign Press awarded Golden Globes to some of the best of the year's film television and streaming entertainment of the year. The Revenant came out on top of the Globes count walking away with three shiny statuettes including for Best Picture – Drama, Best director for Alejandro Gonzales Iñiarritu and Best Actor – Drama for Leonardo DiCaprio, his third Golden Globe from 11 nominations. The Martian also garnered prestigious honors as Best Motion Picture – Comedy and for its star Matt Damon – the third win or him on 7 nominations. Steve Jobs also won two Golden Globes: Best Screenplay for Aaron Sorkin and Best Supporting Actress – Drama for Kate Winslett, her fourth win on 11 nominations. Amidst the golden veterans Sylvester Stallone won his first Golden Globe of an illustrious career for reprising his role as Rocky in Ryan Coogler's boxing reboot Creed. It was not, however, just a night for old friends. 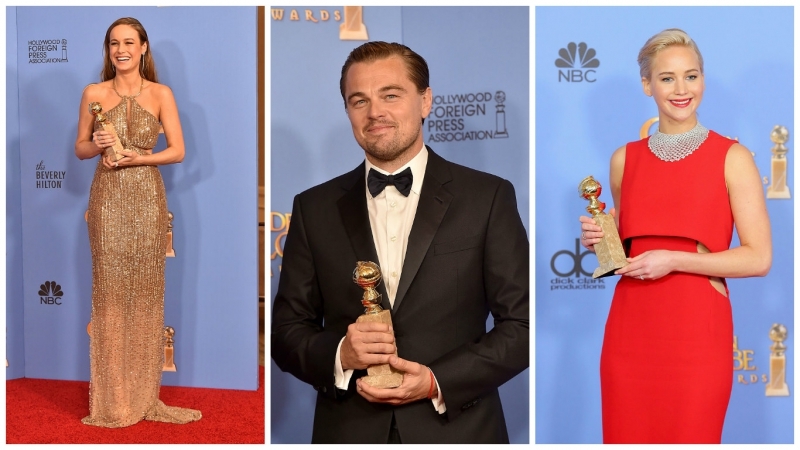 As usual the Golden Globes recognised many new talents. Brie Larson for one, who took home the Globe for Best Actress Drama for her extraordinary work on Room. Sam Esmail’'s remarkable new entry Mr. Robot was rewarded with Globes for Best Television Series – Drama and a Best Supporting Actor nod for Christian Slater and co-author/star Rachel Bloom won a Globe for her thoroughly original Crazy Ex Girlfriend. We'll close this very incomplete list with a mention of our Foreign Language Film winner, Son of Saul, Hungarian first time helmer László Nemes' powerful and intimate film on the Holocaust and the prize awarded to one of cinema's true masters: 87-year old composer Ennio Morricone. His Globe was accepted by Quentin Tarantino who commissioned the score for his Hateful 8 from the Italian maestro who had never before won an American award. Along with the Cecil B DeMille prize awarded Denzell Washington, it was a fitting tribute to those who have devoted their lives to film and by doing so made all of ours better. The true spirit of the Golden Globes.